Torrential rains pummeled Haiti’s North for over five days last week, from Oct. 31 to Nov. 4, causing flooding that killed over a dozen people and affected some 6,000 more. Many agricultural fields were completely destroyed, and livestock was swept away by the raging waters. The most impacted towns were Limbé, Limonade, Dondon, Le Borgne, and St. Raphael. In the city of Cap-Haïtien, hard-hit were the neighborhoods of Saint Suzane, Cité du Peuple, and Chada. The runway of Cap-Haïtien’s newly renovated airport was also flooded, and planes could not land there for several days. According to experts, much of the flooding resulted from clogged drains and canals, which have not been properly maintained over the past three years despite government officials spending hundreds of millions of dollars on touristic and industrial development in the North. Mountains in the North are also largely deforested for the making of charbon, the charcoal used for fuel in Haiti’s cities. Water rushes down the denuded mountains right into the streets of Cap Haïtien. Meanwhile, most victims are left to fend for themselves. Local authorities complain that they haven’t the means at their disposal for rapid emergency response. The central government has been in no hurry to assist victims who have no food, drinking water, change of clothes, bedding, or milk for their children, among other things. The homes and possessions of many flood victims were swept away by the water that was up to three meters deep. On Nov. 5, in the popular neighborhood of Samari, a 9-year old child died of hunger in a shelter. Only after the flooding did government authorities arrive on the scene. 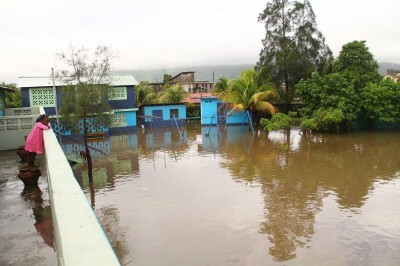 During a ministerial meeting, Prime Minister Laurent Lamothe announced the release of 34 million gourdes (US$742,450) for flood victims, but that money has taken time to reach them. According to disaster workers on the scene, President Martelly has used the flooding tragedy to promote his new party, the Haitian Bald Headed Party (PHTK). On five pound bags of rice being distributed to victims, the PHTK logo is affixed. PHTK banners are hung in food distribution areas, and some disaster workers have been given PHTK T-shirts to wear. Many victims have denounced Martelly taking advantage of this tragedy to make election propaganda.